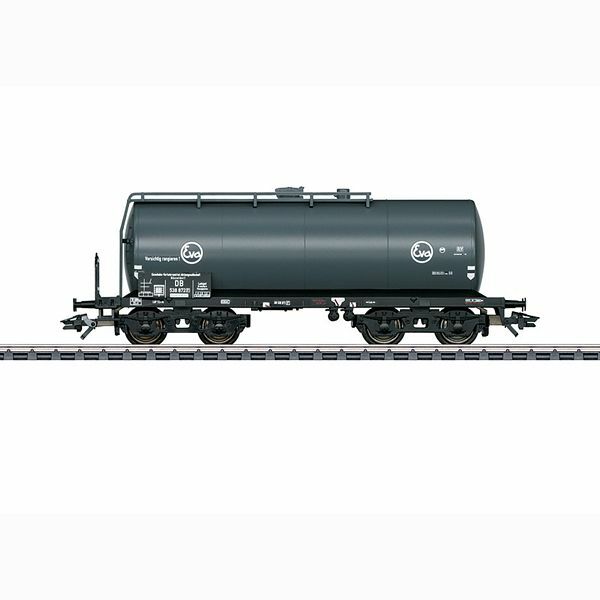 Prototype: Standard design tank car, used on the German Federal Railroad (DB). Older design with pressed sheet metal trucks and a brakeman's platform. Privately owned car for the firm EVA, Eisenbahn-Verkehrsmittel-Aktiengesellschaft / Railroad Transport Resources, Inc., Düsseldorf, Germany. The car looks as it did at the beginning of the Sixties. Model: The car has special quiet-running trucks. It also has separately applied ladders and catwalks. Length over the buffers 14.2 cm / 5-5/8". DC wheel set E32376004.